Mandan belongs to the Siouan language family – a family of language spoken in the Northern Plains and in the Missouri River Valley region. The family includes closely-related languages to Mandan, such as Hidatsa and Crow. Our Mandan ancestors lived in summer and winter villages along the Missouri River, and eventually migrated to the Heart River in North Dakota. 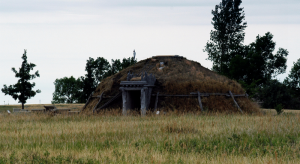 Winter villages were built in lowland areas that were protected from the harsh winter winds of the Plains, while summer villages were located in areas with rich soil where crops could grow well. Lewis and Clark first encountered our Mandan ancestors in the Mittutaka and Ruptare Villages. Until the arrival of Europeans, everyone in the tribe spoke Mandan. With the Europeans came successive disease outbreaks that caused the loss of language and many traditions – first, a smallpox epidemic in the 1780s, followed by another outbreak in the 1830s that nearly extinguished the whole tribal population. Due to the loss of population, the two Mandan villages visited by Lewis and Clark eventually migrated upriver to join the Hidatsas in Like-a-Fishhook Village. Although the alliance with Hidatsas brought some security, U.S. Government policies that forced relocation, prohibited traditional practices and created multiple dams separated many villages and families. This, too, contributed to the decline of the Mandan language. Today, there is 1 fluent speaker of Mandan (over 65) and approximately 6 semi-fluent learners and heritage speakers between Twin Buttes, Mandaree and New Town. Learn what the MHA Language Project – Mandan is doing to support the language.